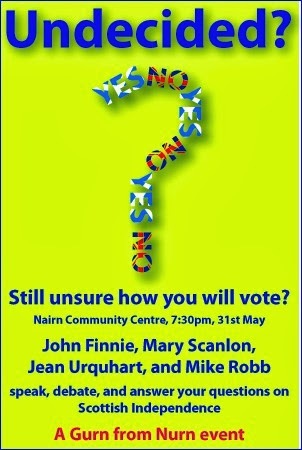 A Gurn from Nurn: Saturday the 31st of May – a night out for the “Undecided” – please save the date! Saturday the 31st of May – a night out for the “Undecided” – please save the date! The Gurn would like to thank : Jean Urquhart MSP (Independent), Mary Scanlon MSP (Conservative & Unionist), John Finnie MSP (Independent), Mike Robb (Highland Labour Campaign Forum spokesperson) for kindly agreeing to speak at the event to be hosted by the Gurn on the 31st of May in the Nairn Community and Arts Centre. More details about how you can participate, before, during and after the event will be published on the Gurn in due course. Looks like an interesting and informative event Mr Gurn. I hope that you get a big turnout. Thanks Colin, hopefully that will happen - pro rata there must be a couple of thousand don't knows in Nairn?